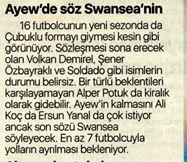 Fanatik report both Fenerbahce president Ali Koc and the club’s manager Ersun Yanal are hoping to see Andre Ayew at the club next season but the final decision will be made by Swansea City. Fenerbahce are looking to offload some of their players in the summer including Leicester City loanee Islam Slimani but the Turkish newspaper report Ayew is still wanted. The Ghanaian winger is one of the highest earners at the club and despite some below-par performances it seems the Fenerbahce technical staff are still keen for him to remain at the club. The 29 year old’s career at the Liberty Stadium could be over if Swansea City spend another season in the Championship and Fenerbahce would look to take advantage. However, last week it was claimed the Welsh club want to sell him on a permanent deal and have informed the Istanbul club about their plans. Clubs in China and the Middle East are reportedly interested in the attacker.